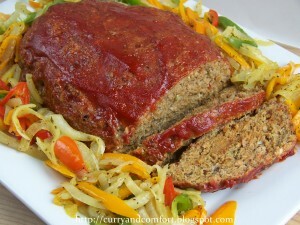 Mix together all ingredients and rub evenly over the pork belly and place in large ziploc bag. Leave it in the fridge for 6-7 days taking it out once a day to rub the cure into the pork belly. Soak 4-5 cups wood chips (hickory or applewood) in water overnight. Drain woodchips and put in a metal pie pan or metal casserole dish. Cover with tin foil and poke lots of large holes in the tin foil. Take the grill off one side of your BBQ and turn the BBQ on the side with the grill taken off to low-medium heat. Close lid and let the heat under the lid get to 200 degrees fahrenheit. Once temperature reached, put woodchip containter on top of the flames and leave until you see lots of smoke coming from the BBQ. Next place the cured pork belly on the other side of the grill. Leave for approximately 1 hour or until pork belly reaches 150 degrees fahrenheit. 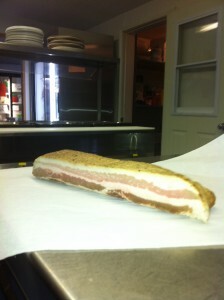 Then place smoked pork belly in fridge to tighten up the fat so it can be sliced. Slice, fry and enjoy! Spread two slices of bread with mustard. 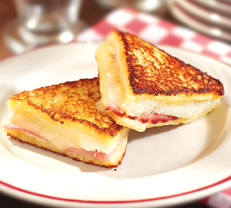 Make sandwiches by layering ham, cheese and remaining bread slices. In medium bowl, beat together eggs and milk. In nonstick skillet over medium-high heat, melt butter. Dip sandwiches into eff mixture, coating both sides well. Lift out and place in skillet. Cook each sandwich on both sides until golden brown. Preheat oven to 225 degrees F. Line 2 cookie sheets with foil. In a large glass or metal mixing bowl, beat egg whites, sugar and cream of tarter to soft peaks. Gradually add the sugar, continuing to beat until whites form still peaks. Drop by spoonfuls 1 inch apart on the prepared cookie sheets. Sprinkle crushed peppermint candy over the cookies. Bake for 1 1/2 hours in preheated oven. 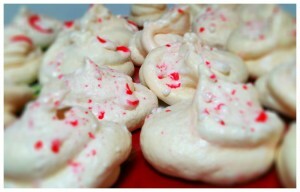 Meringues should be completely dry on the inside. Do not allow them to brown. Turn off the oven. Keep oven door ajar, and let meringues sit in the oven until completely cool. Loosen from foil with metal spatula. Store loosely covered in cool dry place for up to 2 months. 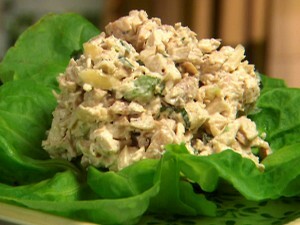 In a bowl, mix the turkey meat, celery, relish, jalapeno pepper and mayonnaise. Season with cilantro, salt and pepper. Chill in the refrigerator until serving.